Federal indictments outlined a sweeping bribery scandal that involved coaches and officials at several top schools. Lamont Smith looks on during a first-round game of the West Coast Conference Basketball Tournament between the Toreros and the Portland Pilots in March 2017. 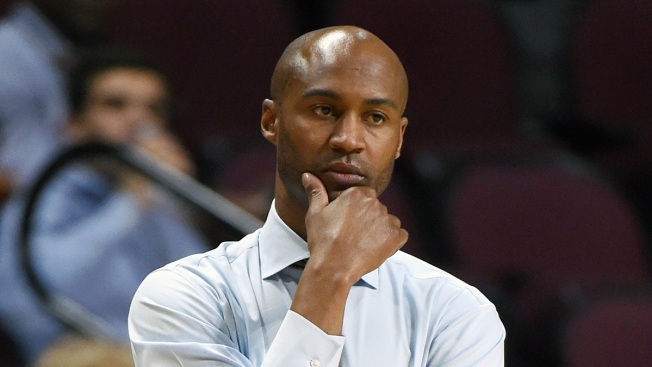 The University of San Diego confirmed Wednesday that former head basketball coach Lamont Smith is the USD employee who allegedly received at least $10,000 in bribes to facilitate the admission of two freshman applicants. Smith is one of several college coaches involved in what federal prosecutors describe as a corrupt scheme in which wealthy parents paid millions of dollars in bribes to assure their children were accepted by some of the nation’s top colleges. Smith resigned his USD coaching position in March 2018 after leading the men's basketball team for three seasons. His resignation followed his arrest last year on suspicion of domestic violence in the Bay Area. Ultimately, no criminal charges were filed in the domestic violence incidentk and Smith later took a job as assistant coach at University of Texas, El Paso. A federal indictment made public on March 19 charged several other coaches in the sweeping bribery scandal. Women’s soccer coaches at the University of Southern California, a men’s soccer coach at UCLA and a tennis coach at Georgetown University are among those accused of felonies related to the admissions cheating scheme. The spokeswoman said the government modified that order early Wednesday, allowing USD to identify Smith as the coach involved in the scandal. "Based on our review of the information available to us to date and on what the government has told us, the only USD employees, students or applicants involved in the alleged wrongdoing are the three people identified by the government: Lamont Smith and two applicants, one is a current student and one declined admission," reads the written statement from USD Asst. Vice President Pamela Gray Payton. Any student falsifying or making misrepresentations on an application for admissions may face disciplinary action up to and including expulsion, Payton added in her statement. According to the complaint, Beverly Hills real estate developer Robert Flaxman is accused of paying $250,000 to a consultant firm in 2016 to secure a spot on the USD basketball team even though his son was not a student athlete. Prosecutors allege the consultant "paid the USD coach for facilitating Flaxman's son's admission." Other court documents confirm that the female student is Flaxman’s daughter. Flaxman is charged with conspiracy to commit mail and wire fraud. He is scheduled to appear in federal court in Boston on March 29. San Diego criminal defense attorney Jan Ronis, who does not represent any of the defendants, told NBC 7 that Smith and others could still be charged with crimes related to the admissions scandal. Ronis said prosecutors frequently file charges against additional defendants as the case unfolds. They can also file more charges against those already arrested. Ronis also said some coaches, parents and others referred to in the criminal complaint might avoid criminal charges because they cooperated with investigators by providing important evidence of wrongdoing by other targets of the investigation. The University of Texas El Paso, where Smith worked most recently as an assistant coach, said it accepted Smith's resignation Wednesday after they were notified of his involvement in the bribery scheme by USD. NBC 7 has contacted Smith about the university's statement. We have not received a response.